When we visited Yafit Amara on Kibbutz Ramot Menashe, 20 miles south of Haifa this spring, she set out to prepare a traditional Ethiopian spread: split peas with dukos, a hot spice blend with chili, dry onion, garlic, and salt similar to berbere, simmered alongside a pot of hearty vegetables and dough for a bread called dabo. The hand-mixed dough did double duty that day: Yafit placed part of it into a large baking dish and tucked it into the oven and formed the remainder into disks called tabunia that are cooked on a skillet, which gave off a subtly sweet smell as they cooked. Yafit learned these recipes from her aunt Temar, who became a surrogate parent when Yafit was still young. Growing up in Ethiopia, Yafit would follow her aunt as she went to braid the hair of the women in her village. Their family was part of the Tigrayan community living in a village called Tzegedey, but the adults spoke often about living in the Diaspora and, as Yafit explained: Israel was always the goal. When Yafit was only five, her family joined thousands of Ethiopian Jews fleeing the country, hoping to escape widespread famine and to return to their homeland. Her mother gathered her, her older brother Asher, a baby brother and set out for a two and a half month journey to Sudan with Temar and her husband Mogidu. There, they lived in a bleak refugee camp, where Yafit’s mother and younger brother passed away. Today, Yafit says she only recalls the saddest moments of life in the camp. Three years after the family set out for Israel, Yafit and Asher arrived with their aunt and uncle, who took the names Ilana and Yitzhak when they moved. The four came with the help of the Jewish Agency just months before Operation Moses, the famous rescue mission in the mid 1980s that brought 8,000 Ethiopian Jews to Israel. They lived together in an absorption center in Atlit, a town along the water in Haifa. It was here that Yafit started to learn to cook, shadowing her aunt’s every move much like she had when she braided hair in their village. Yafit learned to make injera, the staple bread of the Ethiopian community that doubles as utensil, plunged into vegetable dips like the ones below. 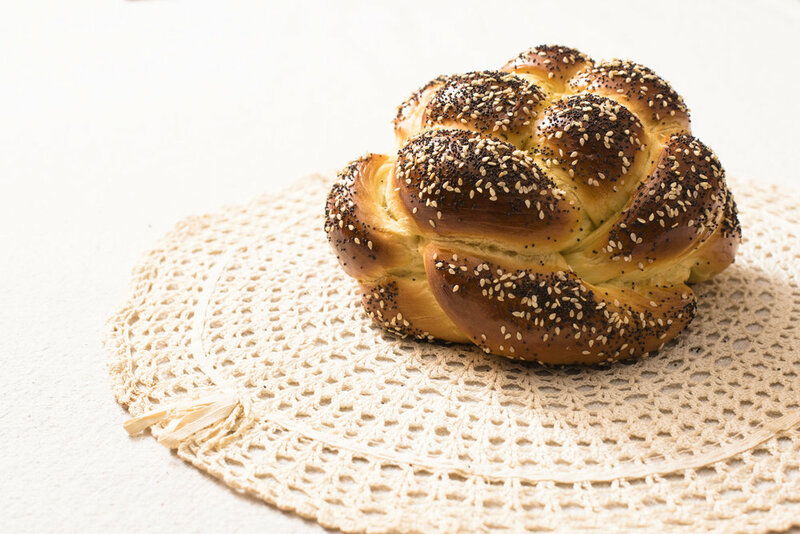 She also learned to make dabo, which functions much like challah in the Ethiopian Jewish community, at times cooked over a low heat overnight so it’s fresh for a Saturday meal. When Yafit left to attend boarding school near Tiberias and later joined the Israeli army, she remained close with aunt Ilana, returning to live with her in Afula as a young adult, mastering more recipes. Today, living on the kibbutz where her brother Asher also settled with his family, Yafit continues to cook Ilana’s recipes in her kitchen. For Israeli Independence Day, she shared some of these traditional Ethiopian dishes with the community. Everyone was excited to try her family recipes and she almost ran out of food before the day of celebrations ended. 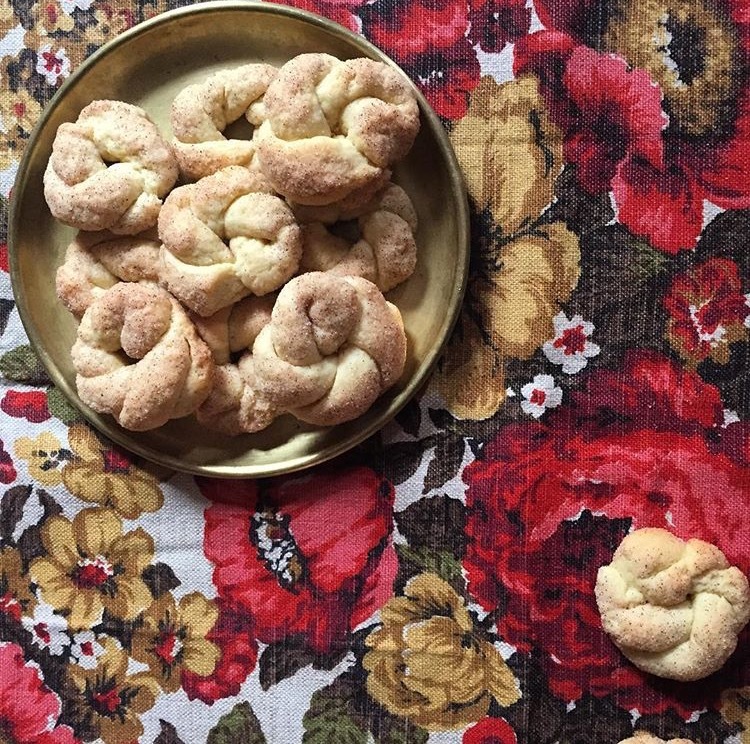 There’s one recipe, however, that Yafit still relies on aunt Ilana for: Dukos. Each year at Passover women from Yafit’s community make a new batch to ensure the mix is fresh and kosher for the holiday. Ilana makes two renditions, one spicy and the other tamer. Yafit once tried to document the blend, but was overwhelmed by the process, which requires ingredients to be roasted separately and for different lengths of time before being combined. For now, she’ll leave that in the hands of aunt Ilana. 1. In a large bowl, combine the all-purpose flour, whole wheat flour, yeast, sugar, fenugreek, coriander, and nigella seeds. 2. Add 3 cups of the water and, mixing by hand, knead until the dough just starts to come together, adding a ¼ cup of water more at a time if the dough still feels dry. Add the oil and knead until incorporated and then add the salt continuing to knead until the dough is even in texture and quite sticky, about 2-3 minutes. 3. Cover with plastic wrap, and let rise for at least an hour in a warm place, until double in size. 4. When the first rise is complete, wet your hands and punch the dough down, kneading lightly for 1-2 minutes. Cover and let rise again, 30-45 minutes. 5. Knead with wet hands for the third time and let rise for the last time before baking, about 30-45 minutes. After each knead/rise, the dough should rise more quickly and begin to develop texture. In winter when it’s colder, you might need to let the dough rise for longer). Oven baking: Preheat the oven to 500°. Line a 9x13” baking dish with parchment paper. With wet hands, move the risen dough to the dish and press and spread it out evenly to fill the dish. Place in the oven and bake at 500° for 10 minutes, then lower to 350° and continue baking for 20-30 minutes, until the top is golden brown and tapping on the hardened bottom makes a hollow sound. Let bread cool and serve at room temperature. Pan baking: Heat a large skillet on the stove top over medium-high heat. Add 1 teaspoon of oil and swirl to coat the pan. With wet hands, pinch off a handful of dough (a little smaller than the size of a baseball) and place it in the pan pressing down with your fingertips to form a rough oval shape. Add another 1-2 handfuls of dough, depending on how much space you have in the pan. Cover and cook for 5-8 minutes until browned on the bottom. Flip using a spatula (or flip right in the pan if you’re brave! ), cover and cook for another 5-8 minutes, until browned on the other side. Move to a serving plate and enjoy immediately. *Berbere can be found at a specialty food market like Kalustyan's or Sahadi's or online. 1. In a large saucepan, cover the soaked split peas with water and bring to a simmer. Cook until the peas are soft, about 1 hour, adding water if necessary. 2. Heat a large stock pot over high heat. Add the onion and sauté until it begins to brown, about 3 minutes. Add ½ cup of water and simmer until the water has evaporated, 2-5 minutes. Add the oil and berbere and sauté until fragrant. Add the garlic and sauté for 1 minute, then add the tomato and bell pepper (if using). Cover and continue to cook until vegetables begin to soften, about 3 minutes. 3. Add the peas, with any remaining water from the pot, ½ cup of water, and the salt. Bring to a boil, then lower to a simmer. Cook, stirring occasionally, until the sauce thickens, about an hour. If it dries out too much before it’s ready, add water. Taste and adjust seasoning. Serve hot with Injera or Dabo. 1. Heat a large stock pot over high heat. Add the onion and sauté until it begins to brown, about 3 minutes. Add the oil, and sauté until the onions are translucent, 3 minutes. Add the carrots, stir and sauté for 2 more minutes. 2. Add the berbere and 1 cup of water and bring to a boil. Cover and cook for 5 minutes over medium-high heat until the carrots begin to soften, then uncover and cook for 5 more minutes or until most of the liquid has evaporated. Add the garlic and sauté for 1 minute, then add the bell pepper, serrano pepper, potatoes, cabbage, 4 cups of water, and the salt. 3. Bring to a boil, cover and reduce heat to medium-low. Simmer for 30 minutes, stirring occasionally, until potatoes and carrots are just cooked through. Taste and adjust for seasoning. Serve hot with Injera or Dabo.